A legislative internship at the Missouri capitol last spring connected Northwest Missouri State University student Maxwell Lyons with another internship this summer at a digital marketing and consulting firm that helped him further explore his interests in politics. 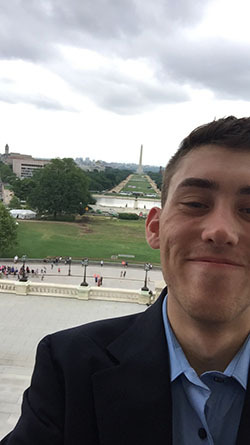 Lyons interned last spring in the Missouri governor’s office and took that experience to his summer internship at Targeted Victory in Arlington, Virginia. He enhanced his experience as a finance major by participating in fundraising, fulfillment and relationship building with donors and clients. Lyons contributed to monthly merchandising and receivables tracking. As an intern in the Missouri state governor’s office, Lyons completed research on legislative history, special projects and other administrative tasks. Lyons credited a friend at the capitol with helping him secure his summer internship. Lyons plans to combine his interests in finance and politics with a career in campaign finance. He hopes to leverage connections with Targeted Victory or a financial firm after graduation.